Also called Trisomy 21, Down's syndrome is the most common chromosome abnormality and is mostly caused by the presence of an extra chromosome 21, and sometimes by the translocation of chromosome 14 or 15 and chromosome 21 or 22. The individual will have varying degrees of mental problems and multiple defects. The incidence of Down's syndrome caused by an extra chromosome 21 is 1 in 600 to 650 live births and is associated with maternal age (over 35 years) and can rise to an incidence of 1 in 80 for mothers over 40. Down's syndrome caused by translocation is hereditary, the incidence being 1 in 5 if the mother is the carrier and 1 in 20 if it is the father. There is a third cause of Down's syndrome which is the much rarer mosaic variant, in which there is a mixture of trisomy 21 and normal cells. This usually leaves the individual with fewer physical defects and less severe mental problems. Mosby's Medical, Nursing and Allied Health Dictionary gives an average IQ of between 50 and 60 for Down's syndrome individuals although IQ scores of 120 have been found in some individuals with the syndrome. Down's syndrome gives a characteristic appearance, a slant to the eyes, flattened noses, depressed nasal bridges, low-set ears and a large protruding tongue. Adult individuals tend to be shorter than average and stocky in build and are prone to respiratory infections, pneumonia and lung disease. Down's syndrome is not an illness. Changes in the approach to people with Down's syndrome in the last few decades have drastically improved life expectancy, so that individuals who survive the first five years (when most deaths due to heart problems occur) have an 80% chance of living until their 20's, and a 60% chance of living beyond 50, the average age of death being mid-fifties. Care of an individual with Down's is mostly the same as with any child, although there will be medical complications that go with the syndrome which will have to be dealt with if and when they occur. It is now generally agreed that as the child grows older he or she should be as fully integrated into the community as their understanding and abilities allow. Alzheimer's disease - in the general population approximately 6% will develop Alzheimer's disease. For adults with Down's syndrome the risk increases to 25%. Many individuals with Down syndrome have the changes in the brain associated with Alzheimer's, but do not necessarily develop the clinical disorder. Atlantoaxial Instability (AAI) - this describes a condition found in approximately 14% of individuals with Down's syndrome. The cervical spine has increased mobility at the level of the first and second vertebrae which can lead to compression of the spinal cord. This can lead to neck pain, loss of upper body strength, changes in bladder and bowel functioning, changes in gait and unusual posturing of the head and neck. The majority of the 14% who have AAI will be asymptomatic, but about 10% of individuals (representing 1% of all people with Down's) are likely to experience problems, especially if the individual is involved in sporting activities. Celiac disease - this occurs in between 7 to 16% of children with Down's syndrome. (see our fact sheet on Celiac disease). Dental - teeth usually come through late and in an unusual order. Some teeth can be missing and those that are present can be small and misshapen. Because the mouth is small crowding can occur. Individuals can have problems with gingivitis and periodontal disease. Ear, nose and throat - many people with Down's syndrome have problems with obstructed airways leading to snoring, unusual sleeping problems and sinusitis. Eyes - congenital cataracts are a serious problem and can lead to blindness if they are not treated early. Common conditions are Blepharitis (in which the lash follicles and meibomian glands of the eyelids become inflamed, red and sore and leave crusts of dried mucus on the lids), and conjunctivitis (inflammation of the conjunctiva leading to red eyes, thick discharge, inflammation without pain and sticky eyelids in the morning). Hearing Loss - this is a significant concern for an individual with Down's syndrome. For some the loss may not occur until their teens leading to misdiagnosed behavioural disturbances. Heart - heart problems are reported to occur in 30 - 60% of children which may lead to surgery, usually during the first six months of life. Immune system - individuals with recurrent respiratory and systemic infections often have problems with their immune system. Leukaemia - individuals with Down's syndrome have a 15 to 20 times greater risk of developing leukaemia. Most of the cases are acute megakaryoblastic leukaemia, which tends to occur in the first three years of life, and for which there is a high cure rate. Another form of leukaemia is also seen in new-borns with Down syndrome, one that disappears spontaneously during the first two to three months of life. Decreased muscle strength - this may lead to the child locking their knee when standing. Increased flexibility in the joints, especially the hips - this makes the joints less stable and makes it harder for the child to balance. Hypotonia (decreased muscle tone) - The brain controls muscle tone in its resting state. It affects children with Down's syndrome to different degrees. Hypotonia diminishes over time but will persist throughout life. Children learn compensatory strategies like leaning against things when standing. Short arms and legs - make it more difficult to learn sitting because they cannot lean forward and use their arms to prop them up. When falling, they fall further before being able to catch themselves and short legs makes climbing more difficult. Delayed development - children with Down's syndrome usually learn to walk at 24 months rather than at the average 12. Seizures - 5 - 10% of individuals with Down's syndrome are likely to experience seizures which are most prevalent in infancy and then again in the 20s and 30s. (see our fact sheet on epilepsy). Thyroid problems - thyroid disease is significantly increased among individuals with Down's syndrome and has an effect on growth and cognitive functioning. Children with Down's syndrome will walk at 24 months whether they have physical therapy or not, however physical therapy from a very early age can help to avoid the child developing abnormal compensatory patterns for the problems described above. A child with Down's syndrome who does not have physical therapy can develop problems in adult life that can impair physical functioning. Children with Down's syndrome have a high risk of developing speech and language problems. Problems with hearing can be a factor but problems can also arise from poor development of the muscles of speech production, a large tongue and a small oral cavity. Therapy focuses on exercising the muscles of speech production as well as focussing on memory and understanding. - article "Health Care Guidelines for Individuals with Down Syndrome", Edited by William I Cohen, MD for the Down syndrome Medical Interest Group, reprinted from Down Syndrome Quarterly, Volume 1, Number 2, June 1996. - article "Comprehensive Speech and Language Intervention for school-Aged Children with Down Syndrome", Libby Kumin, Mina Goodman, and Cheryl Councill. (Down Syndrome Quarterly, Vol.1, N.1, March 1996). - www.ds-health.com - Dr Leshin's website. A comprehensive site linking through to other related sites, constantly updated. Includes articles about Down's syndrome. Comprehensive information from the Riverbend Down Syndrome Parent Support Group (US). There is a movement based in America which believes that giving nutritional supplements to a child with Down's syndrome can lead to the child developing, among other things, near normal growth rates and mental abilities, and losing the facial characteristics typical of the syndrome. This is based on the idea that it is not the extra chromosome, but the resulting metabolic imbalance that is problematic.
. Dr Henry Turkel - "U-Series"
In the 1940's Henry Turkel, MD observed that the extra 21st chromosome led to a number of metabolic errors. He sought to give supplements to try and address these and put individuals' metabolic system back in balance. He put together a mixture containing vitamins, minerals, fatty acids, digestive enzymes, lipotropic nutrients, an amino acid, and a number of drugs (thyroid hormone, antihistamines, nasal decongestants and a diuretic). He called this intervention 'orthomolecular therapy' and the supplements were called "U series". However the Food and Drug Administration only gave approval for him to practice in Michigan.
. Jack Warner MD - "Hap Caps"
Turkel's work was refined by Jack Warner, a doctor based in California, who added physical therapy and developmental optometry to the treatment. (Developmental optometry uses exercises and, among other things, lenses, prisms and filters to correct problems with the eyes). He removed drugs from the medication believing that they were only necessary in 30% of cases and in these instances could be prescribed by the attending physician. Dietary supplements are given (called "Hap Caps") and are formulated to counteract specific disturbances in the antioxidant enzymes, catalase (which show abnormally low levels), and superoxide dismutase (which show abnormally high levels). "Hap Caps" contain high dosages of dietary antioxidants like vitamins A, E and C, and minerals zinc, copper, manganese and selenium, which help these disturbances. As digestive enzymes are produced in smaller quantities so supplements of these are added to the formula. Also disturbed is amino acid regulation, which can in part be corrected with vitamins B6 and B12. Dr Warner's approach also incorporates counselling for parents and carers with a view to explore parent's attitudes to their child's potential, and physical therapy to address the problems associated with Down's syndrome.
. Dixie Lawrence-Tafoya - "Nutrivene-D"
In the early 1980's, Dixie Lawrence-Tafoya, a mother of a child with Down's syndrome, adopted elements of both treatments and added new factors to create Targeted Nutritional Intervention (TNI). Her additions include amino acids, smart drugs (she claims good results from Piracetam -see separate fact sheet 'smart drugs'), and early intervention. Her programme is recommended to be started as soon as possible, (some foetuses have been treated in the womb), and claimed to be most effective if it is begun before the infant is 11 months old. She recommends creating an individualised programme and includes a diet rich in digestive enzymes (found in raw carrots and raw vegetables) and avoiding foods with enzyme inhibitors (e.g. nuts) as well as using a whole range of vitamins and smart drugs. In 1996 she promoted a formula called Nutrivene-D, manufactured by International Nutrition Inc. and set up a non-profit company called Trisomy 21 Research Foundation with a 'Scientific Advisory Committee' whose stated aims are to control modifications to the "Nutrivene-D" formula. International Nutrition Inc. states: "Nutrivene is not a drug and does not require FDA (Food & Drug Administration) approval. However, all nutrients contained in Nutrivene are FDA-approved and products are manufactured in licensed U.S. pharmaceutical facilities." Set up by Dixie Lawrence-Tafoya to promote the use of smart drugs for Down's syndrome. Publishes a bi-monthly magazine. Back issues contain a number of articles about Down's syndrome and alternative approaches to treating it. intervention recommended by the Cognitive Enhancement Research Institute. - www.ceri.com/pira97.htm - outlines the case for using Piracetam in Down's syndrome. DMSO is an industrial solvent, it has Food and Drug Administration (FDA) approval only for treatment of a rare bladder condition called interstitial cystitis. It is used as a carrier agent to take amino acids directly into the brain, which, its proponents claim, will improve cognitive and motor skills. The use of DMSO is controversial, opponents to this type of treatment worry about the side effects which can include eye damage, headaches, nausea and skin rash. In 1976 Aspillaga, Avendano and Morizon studied the effects of DMSO and amino acids on children with Trisomy 21: "It seems to us that DMSO-acid therapy of children with trisomy-21 signifies an evident advance in the therapy of this syndrome" (Trisomy 21. Results after 18 months of treatment with dimethylsulfoxide and amino acids) Rev Chil Pediatr. 1976 Jul-Aug;47(4):315- The validity of this study was questioned by other scientists (see below Dr Leshin's webpage on DMSO). This is the Sierra Clinics website where this treatment is used. - Lobaugh N, Karaskov V, Rombough V, et al. Piracetam therapy does not enhance cognitive functioning in children with Down syndrome. Arch Pediatr Adolesc Med. 2001;155:442-448. "Piracetam therapy did not enhance cognition or behavior but was associated with adverse effects." "In summary, it is regrettable when parents are given false hope through unproven remedies, and rigorous studies such as this one are essential to counter such claims. However, we should not let our experience with worthless media-publicized claims inhibit us from identifying positive effects when they are present. A more justifiable conclusion would have been that while dramatic effects were not observed, and there were indications of adverse effects with certain children, small gains in cognition and behavior were also evident." Research suggests that mothers of downs syndrome babies have low levels of folic acid. - James SJ, Pogribna M, Pogribny IP, Melnyk S, Hine RJ, Gibson JB, Yi P, Tafoya DL, Swenson DH, Wilson VL, Gaylor DW. Abnormal folate metabolism and mutation in the methylenetetrahydrofolate reductase gene may be maternal risk factors for Down syndrome. Am J Clin Nutr 1999;70:495-501. Conventional Medical opinion in the USA and UK is cynical about the value of supplements. This is largely because there is no proof that they are responsible for any changes noted in individuals with Down's syndrome, and there is a lack of research to verify claims about their efficacy. There is some concern that parents can easily be seduced by companies claims and pay a lot of money for no guaranteed results. It seems that most research findings contradict each others which makes it very difficult for parents to find out whether nutritional supplements work or not. The DSRF will part fund an antioxidant research project which will be led by the Institute of Child Health. The website also contains information on zinc which was shown to be deficient in individuals with Down' syndrome. The following tests can help to identify metabolic disturbances. Blood and urine analysis - identifies metabolic needs. Red-blood-cell mineral analysis determines nutritional trace mineral deficiencies and excesses. Hair mineral analysis shows - heavy metals, lead, mercury, cadmium, bismuth, and arsenic etc and is also good for nutritional assessment. Antioxidant profile - measures the levels of specific antioxidants (ascorbate, carotenoids, tocopherols, bilirubin, ubiquinone, urate) and is thought to be very useful. Oxidant stress test - measures the ability of living cells to resist oxidative stress in an ex vivo assay. Organic testing - measures the many chemicals found in urine - useful for fine-tuning a nutritional programme. By quantifying the waste acids in urine, signs of over-active or under-active enzyme systems can be identified. Gluten intolerance - some doctors have reported a high incidence of celiac disease amongst Down's patients. This is an illegal practice in America and involves injecting live cells from animal embryos into humans. It is also known as Sicca cell treatment, dry cell or fetal cell therapy, and was first introduced in the 1930s in Switzerland by Niehans, then developed in Germany by Schmid. Proponents of this treatment believe that by injecting healthy cells into the body they are able to replace the old, sick or defective cells. There is no risk of rejection of these cells as the antigens that would cause a reaction are not present in the embryo (they do not develop until after the animal is three days old). Two studies were carried out in the 1960s to evaluate the efficacy of this intervention. Both showed that individuals who were treated with the therapy did no better than individuals who were not. In 1987 another study was carried out to compare treated children with untreated children on a number of criteria including height, weight, facial appearance, developmental quotients and hair and skin quality. The only criterion that showed a statistical difference was that of the treated children's hair 'force' quality, which was better than that of the untreated children. Risks from the therapy include Creutzfeldt-Jakob disease ("mad-cow disease") which is presumed to be passed from an infected animal to a human through products that are eaten or injected, and allergic (possibly life-threatening) reactions. - http://www.ds-health.com/cell.htm Dr Lehsin's article. 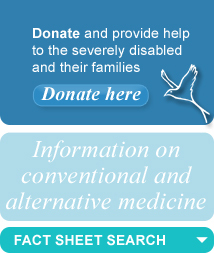 See also our fact sheets on facilitated communication, cranial osteopathy and dolphin therapy. The Henry Spink Foundation has several fact sheets on therapies that may help treat conditions associated to Down's syndrome.